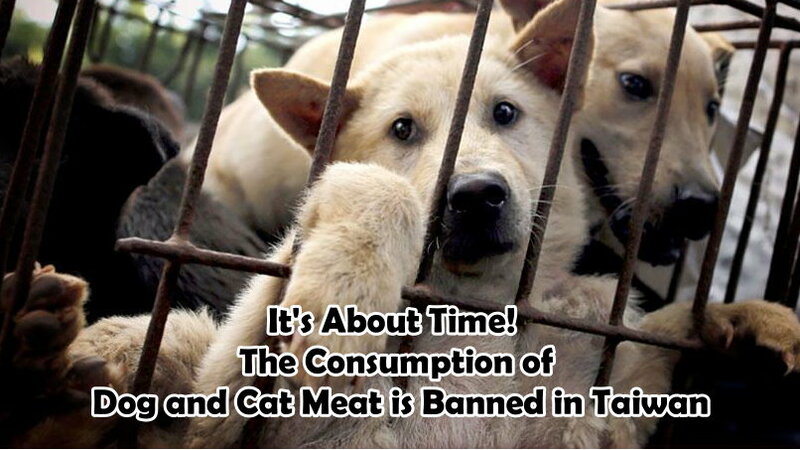 Taiwan became the first Asian country to ban the consumption of dog and cat meat. That’s great news. Now let’s hope that the rest of the world follows suit, and band the consumption of companion animals. Tsai Ing-wen, Taiwan’s president, took her two cats on the campaign trail, and she also adopted three retired guide dogs last year. Showing that she’s an animal lover. Now, there’s been an amendment added to the Animal Protection Act. The amendment added to the Animal Protection Act, which previously covered only the slaughter and sale of dog and cat meat, now specifically prohibits the consumption of dog and cat meat. And now, the fine for individuals caught eating dog or cat meat is $1,640 to $8,200. Which is great news in the animal world. The amendment gets even better, by banning “walking” pets on a leash pulled by cars and motorcycles. And raises the penalty for cruelty to animals. It doubles the maximum prison term for animal cruelty to two years in jail. And raises the fine to up to $65,500 for any act that deliberately harms animals and results in mangled limbs, organ failure or death. It also allows for violators names, photos, and crimes to be publicized, according to Taiwan’s Central News Agency. Unfortunately, in many parts of Asia, dog and cat meat are regularly consumed. China, the Philippines, Korea and Indonesia, to name a few. You’ve probably seen all of the recent dogs rescued from the South Korean dog meat farms. Dogs rescued from South Korean meat farm brought to S.F., Dogs rescued from South Korean dog meat farm arrive in U.S. to name a few. Hopefully, Taiwan’s new law will send a strong message to China and South Korea where the dog meat trade remains. And soon they’ll too, pass laws that ban the consumption of dog and cat meat.